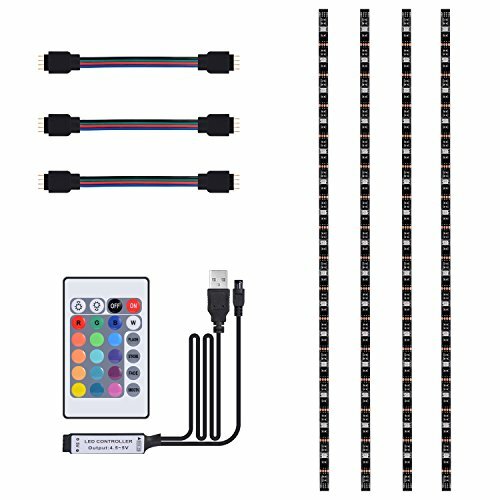 ❤What You Get: 4pcs 1.64ft led strips, 3pcs light strip connectors, 1pc 24key remote controller (battery included), 1pc LED controller with USB interface. 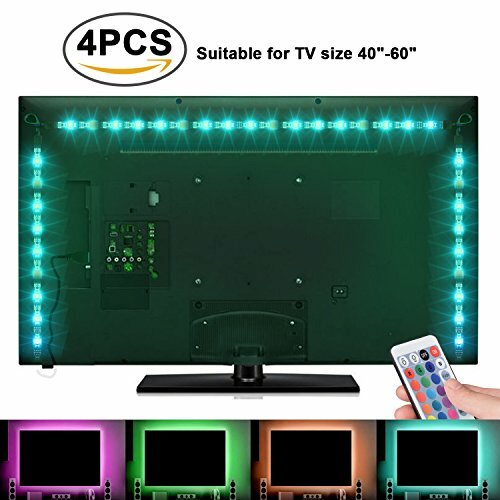 ❤Relieves Eye Strain: TV Backlight helps reduce the eye strain caused by long exposures to TV screens and monitors in dark rooms and creates a comfortable bias lighting when watching TV or playing games. 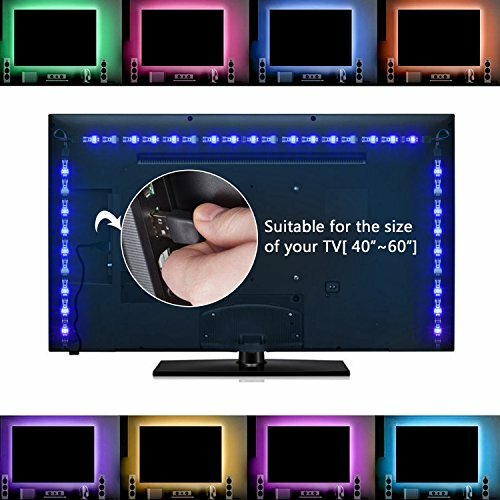 ❤16 colors and 4 dynamic modes: LED TV backlight, dimmable. 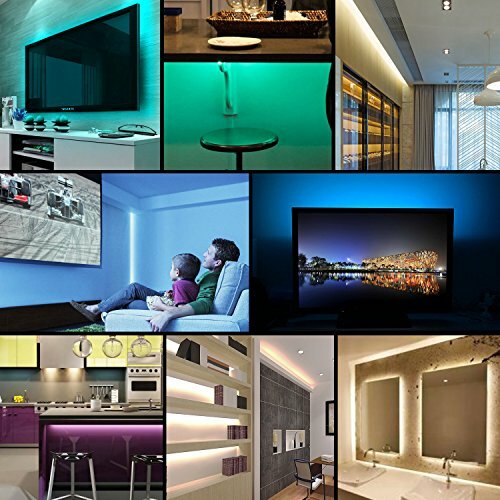 You can use the remote control change the color, the brightness as well as different lighting modes. Control distance is 8-10m. 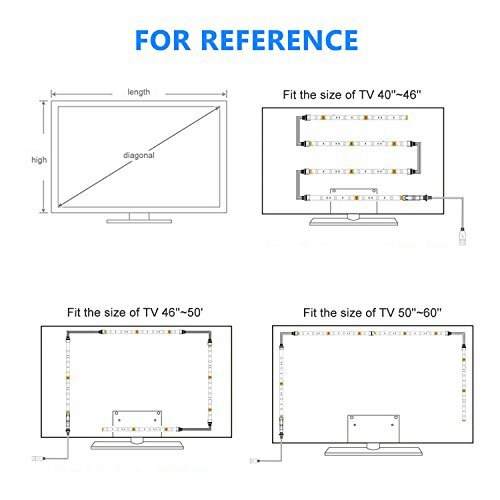 The light strips can be cut down along the cutting marks to fit different size of your TV, computer, wardrobe and other furniture. The bendable and flexible strips are easy to change different shapes. You and your kids will enjoy fun and creative lighting decoration. Adjustable brightness and changeable flash rate make your house colorful and interesting. The soft light can be night lamp for your occasional evening/night activities. The ambient light strips provide general lighting for the space, and add romantic and dreamlike atmosphere for your party and banquet. Work with low temperature, safe and touchable to your kids. 3M adhesive makes your installation easily. 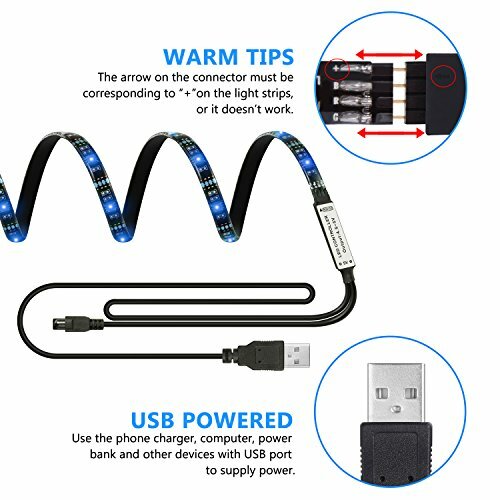 USB rechargeable, eco-friendly and energy saving, you can connect light strips to computer, phone charger or power bank with USB interface. Feel free to settle it on anywhere you want. Free replacement and money return are provided within 12 months, if you aren’t satisfied with the product, simply email to our customer service. 1. Keep the surface clean before stick the strip light for better viscidity. 2. The strip lights must be connected with corresponding polarity. 3. Use the alcohol to remove the residual 3M adhesive tape. ❤Easy Installation: We use upgraded super sticky 3M adhesive for this led light strip to provide secure and strong installation without worrying about falling off. Just plug-and-play. Input: 5W (5V, 1A). Please check USB output prior to use. 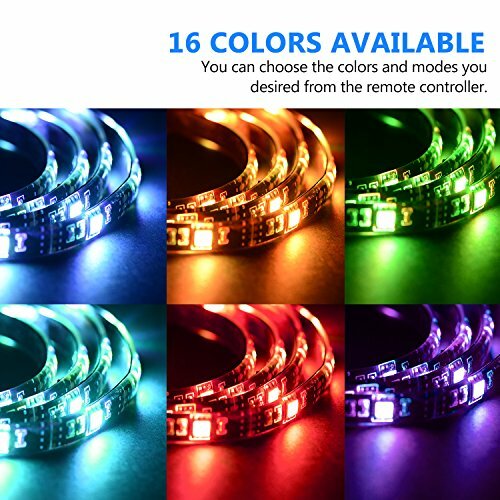 ❤Safe and Wide Application: 5V 5050 RGB LED backlight strip features low power consumption and extremely low heat. It is touchable and safe to children. Perfectly used for boutique lighting, stairs lighting, makeup mirror, wine cabinet decoration, Christmas, Halloween, festival lighting decoration, clubs, and other indoor decoration.